Frozen Ape presents the next generation of the bestselling metronome app for the iPhone OS: Tempo 2. While retaining the same hyper-accurate audio engine from Tempo, the interface has been completely redesigned to put the focus on the metronome display. 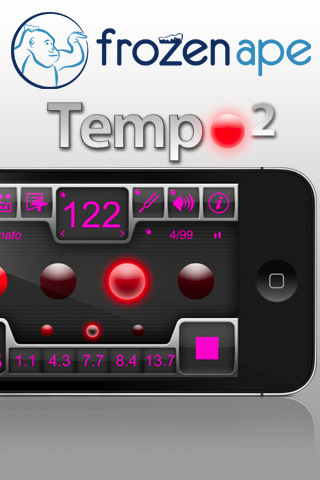 Tempo 2 is aimed at the advanced user who needs more out of a metronome app. Tempo 2 was designed with the iPhone’ display size and multi-touch in mind. A large “virtual LEDs” display takes center stage, surrounded by controls for more frequently-used functions. Advanced options are accessible via five modal panels that appear when certain buttons are held. Tempo 2 works in both Landscape and Portrait, with the interface for each specifically tailored to the dimensions. Meters are represented as simply the number of beats per measure, and the number of divisions per beat. Coupled with the ability to customize every beat and sub-beat, this gives you maximum flexibility in defining the time signature you want. Auto setlist advancement, accelerando, ritardando and bar tracking makes it possible for you to program count-ins or complex songs with varying tempo, time signatures and rhythms. ATTENTION: No speaker support for 1st gen iPod touch.